Apothecary Deluxe is a feast of shape and symmetry with a wavy chevron pattern creating ripples of color behind a framed arabesque-shaped white panel. The visual effect is striking but harmonious - drawing attention to center stage, where your text steals the show! Set in high-contrast black type, the fonts for Apothecary Deluxe have strong individual appeal and they look great in combination. The largest bold caps are subtly distressed, like turn-of-the-century wood type. A thick italic mirrors the subtle sway of the chevron pattern, a classic serif adds a touch of friendly formality and a retro all-caps font is printed at a slight slant in red ink, as though rubber-stamped by hand. Apothecary Deluxe is offered in a palette of 28 lavish colors: lights, darks, brights and neutrals - all ready to customize for your product, business or special event. 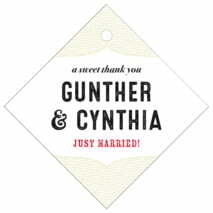 Customize your Apothecary Deluxe wedding favor tags today to add a special touch to your wedding. 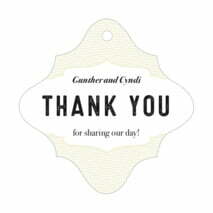 Our Apothecary Deluxe wedding favor tags are printed on extra-thick cover weight white paper and come in a variety of shapes and sizes (diamond, circle, heart, square, scallop-edged circle, ovals, and other more intricate shapes). And our Apothecary Deluxe wedding favor tags come pre-punched with a small round hole to thread your choice of tie material. They are punched out individually and packaged as a set in small bags. At Evermine, we've put a tremendous amount of thought into our packaging, material quality and lovingly created designs to make all your products and gifts perfect. 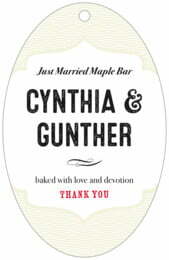 Start personalizing your Apothecary Deluxe wedding favor tags today!